Swiss architect Christian Kerez speaks of his body of work and his admiration for Japanese design. Swiss architect Christian Kerez playfully leans over the large-scale version of a housing unit he designed for a Sao Paulo favela and points to one of the three-story wooden apartment buildings. “This is where I want to live,” he smirks. The expansive model of Kerez’s Social Housing in Paraisopolis (2009-2014) is currently on display at Gallery Ma along with four other renditions of his most prominent projects, all presented through multi-media platforms displaying each project at every stage of the planning process. 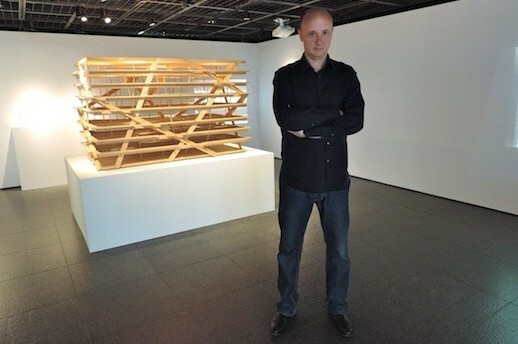 Gallery Ma Chief Curator Kumiko Ikada says Kerez was invited to exhibit at the museum because of his distinctive work, his refusal to adhere to preconceived notions and his ability to simplify the complex, reducing buildings to the primary principles. While this is Kerez’s first exhibition in Japan, he has visited four times prior, lecturing in Tokyo and Kyoto. A professor of design and architecture at ETH Zurich, he proclaims to be fascinated, “even obsessed,” with Japanese architecture. Subconsciously, Kerez says his past collaborations with Japanese colleagues influenced his design for the Sao Paulo favela. Kerez spent two weeks studying the urban housing complexes of Brazil, which hold a stigma as being slums or ghettoes. However, he was fascinated with the urbanism, and with his winning design, he strove to reflect the culture and conventions of the inhabitants. However, only when the design was complete did he realize the Japanese influence. 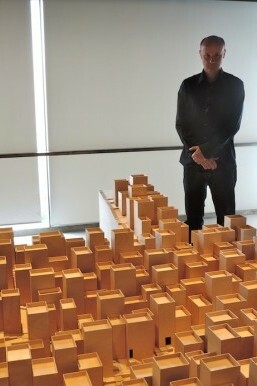 Kerez says he is fascinated with the work of Japanese architects such as Kazuyo Sejima and Ryue Nishizawa of SANAA, and his acquaintance Sou Fujimoto, whose use of delicate light structures and permeable enclosures is reflected in some of Kerez’s work such as the Holcim Competence Center (2008). The design for the Swiss concrete company’s headquarters was to encapsulate the company’s research, education and administration facilities under one roof. To bring all facets of the facility together, Kerez incorporated gaping light wells that branched vertically through each floor, allowing employees to observe the comings and goings of every department. Coinciding with his design of the Holcim complex, Kerez developed the design for its sister high-rise, the Swiss Re Next (2008). This groundbreaking design, which ultimately lost in competition, completely defied convention. Most high-rise buildings have the structural core, which houses the stairway, fire security, utilities, etc. These are generally vertical shafts that limit the creativity of the architect. However, the stairs for the Swiss Re Next don’t follow the structure. The structure follows the movement of the stairs. Kerez’s latest unconventional design, the Highrise in Zhengzhou 1 & 2 (2011/20012-2013) has traces of Kazuo Shinohara, who applied architectural theory in an anomalous fashion. The columns of the 120 meter Zhengzhou high-rise will measure in at a mere 15 cm. Instead of having a hierarchical system of columns, Kerez implemented oblique shifted columns, with more loads at the bottom of the structure that decrease with each ascending floor. To protect the high-rise from side to side motion, Kerez installed tension wires stretching out from the side of the building like tent tethers. The fifth model on display at Gallery Ma is perhaps Kerez’s most notorious project, the Museum of Modern Art in Warsaw (2006-2012). Like most of his projects, the Warsaw MoMA design is composed of two elements, this being in the overlap of the two roof structures. One roof structure is supported with columns and beams on the ground floor like the profane roof of a city square, while the other is vaunted. “We designed certain spaces to be a provocation for artists. In this form, these are spaces that do not exist yet, so it would be great to challenge the artists to create artwork for specific spaces,” says Kerez. While the Warsaw project dragged on for seven years, with Kerez being forced to wrangle with several political and public factions, the plan was ultimately put on hold when it was discovered the city of Warsaw did not own the land. Kerez will travel to Brazil in two months to hopefully move forward with the social housing development, however, he said political upheavals have caused delays and barriers there as well. ***Christian Kerez “The Rule of the Game” runs until September 28. Gallery Ma will be closed for summer holidays August 11-19.